Grace's original design of the first Pro-Life Prayer Pillow. 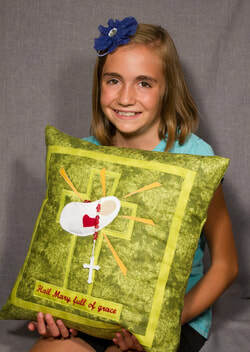 The Pro-life Prayer Pillow was started in prayer through a girl named Grace when she was seven years old. After a holy hour for life (an hour spent in prayer with Jesus), she told her mom that she wanted to make something, sell it, and "give the money back to mommies so that they could buy diapers and not do abortions." When her mom asked her what she wanted to make, she said, "I want to sew a cross and stuff that cross and on the cross I want to put a baby...because those babies suffer like Jesus suffered on the cross. Then," she said, " I want to put a heart with rays of light coming from that baby..."
The first Pro-life Prayer Pillow was then created by Grace and her family in 2012. Since then, seamstresses and volunteers have gotten involved, new designs have been created and tens of thousands of dollars have been donated to pro-life groups and women in need. 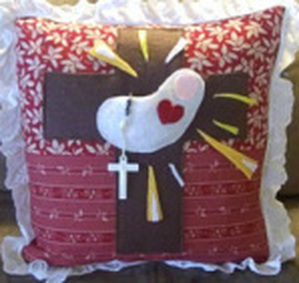 Proceeds from the original Pro-life Prayer Pillow (pictured on left) are donated to pro-life organizations or the proceeds are used to purchase items directly for abortion-minded women and their children (diapers, baby items, etc.). Proceeds from all other Pro-life Prayer Pillows (see store for all pillow options) go directly toward our Pro-life Educational Fund. This fund supports the pro-life education that we are doing in the schools - bringing ultrasounds and a pro-life, pro-God, pro-family message to our youth (go to presentations to find out more). ​To watch video about Pro-life Prayer Pillows -click here. Nebraskans United for Life’s goal is to restore a culture of life through: legal, social and personal recognition of the value and right to life of each individual, from biological beginning to natural death, and ensuring abstinence is presented as a positive choice. All of their services are free and confidential. Every day, their programs provide pregnant women and mothers with the medical, educational, material, financial and emotional support they need to become healthy, knowledgeable, and caring parents. Gabrielle's Corner is a Christ-centered ministry serving young women and men who are facing an unplanned pregnancy. It is their desire to provide nurturing support and advice to these young people before, during and after their pregnancy. Material, medical and emotional support are provided. Bethlehem House provides support to pregnant women to choose life for their unborn child in a Catholic, residential environment both during and after pregnancy. Bethlehem House educates each woman on child care and personal life skills to assist them to be self-sufficient. St. Gianna's Home provides a safe haven for women who are in an abusive situation and pregnant. The workers at St. Gianna's home support the women with love, practical support and in choosing life for their babies. Mater Fillius is a new home for pregnant women in Omaha which provides love, care, material support, counseling service for the mother and her children. This fund directly supports the pro-life education that we are doing in the schools and with our youth. * As we continue to grow and support more organizations in and out of state, not all organizations are listed. Thank you.